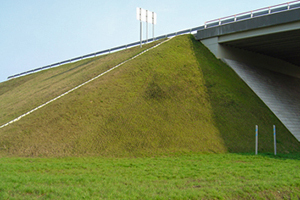 Presently little attention is paid in Hungary to the erosion control of slope surfaces although solutions are available. 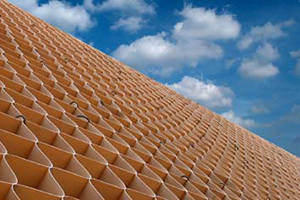 Gradex Ltd. offers a wide range of solutions to erosion control considering both weather conditions and geometry. The type of protection is normally determined by the angle of the slope, but the soil and geometrical location of the slope and rain intensity must also be considered. For slight slopes jute or coconut shuck protection is sufficient onto which grass seed is sown or grass will grow through it. For steeper slopes some form of spatial geogrid is required that can be filled with humus or even rubble. For even steeper slopes geocell protection is recommended that can be filled with soil, but they are typically filled with stone. Stone fill is also used for geocell slope protection installed along rivers or creeks, or into flood protection dams, or roads that also serve as flood protection dam at times of high water level. 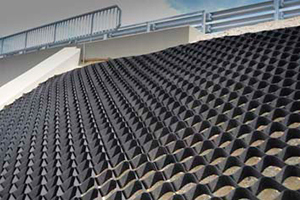 Gradex Ltd. installed slope protection at several locations. We covered slope cones with geocells on Road 610, installed geocell slope protection with stone fill to the M70 motorway in the flood zone of the fast Mura River. A large amount of slope protection with stone fill was installed on the M6 motorway where the embankment also serves as flood protection dam to the Danube. We also installed geocell protection with rubble fill to railway embankments to prevent surface runoff.